In case you are trying to solved Sony C1905 with Charger error problem when the charger is plug-in this solution may possibly help for your troubleshooting. Might be the problem in charger or charger’s pin. It also happens due to the dust present in charging connector of your phone. Dry soldering of charging pins, you need to re-solder them again. However for that you need to remove metal sheet over charging pins with the help of a heat gun in order to access charging pins for soldering. Might be due to uneven voltage. It happens due to faulty circuit. Fuse or Capacitor might also be faulty. It is always great that if workaround methods are able to resolve your charging problems, as none of us wants to go into the hardware of their phone. Check with any other original Samsung charger. Clean charging connector of your phone from outside and check. Check, clean or replace the charging pin connector (DC jack). clean also the PCB pads. Check the charging voltage (VCHARGE). Check the below image for Charging Ways. If any Track ways is missing just apply jumper. Trace the charging usb Ways Marked in above image. If any of track ways is missing just make a jumper with jumper wire. 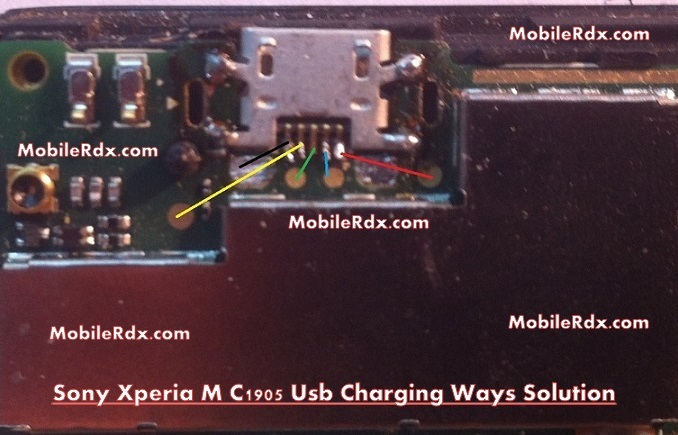 Sony C1905 Charging Solution,Usb Ways,Charging Jumper,Sony Xperia M C1905 Charging Ways,Usb Not Recognized Problem.